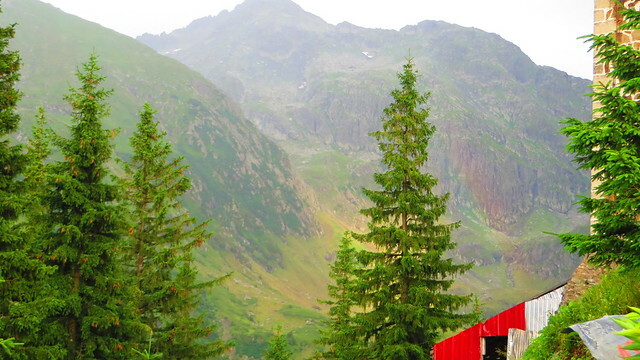 We had another attempt last year in August to go up to the Negoiu Peak, when we had our trip in the Fagaras Mountains. But we just couldn’t make it back then, as it was our last day of the trip and we were sooooo tired. But, this time, getting on the peak was our main purpose of the trip and we did it. We left Sibiu on Friday after-noon, right just after leaving the office in the direction of Porumbacu de Sus. By car we got almost where the hiking trail to the Neogiu Chalet starts. It’s a forest road and quite bumpy from time to time, but we managed to drive there safe. Which we actually had to, because otherwise we would have had to walk about 15 km and we didn’t have nor the time, nor the energy to do it. So from where we left our car (hoping that we would find it when we came back on Sunday), we had another two hours of hiking to get to the Negoiu Chalet, following the blue triangle sign . So we started our trip. After just a little while, we found this beautiful salamander on our way and we had to stop to take a photo of it. Getting to the Negoiu Chalet can be quite difficult, as you have to go mainly through the woods and you only go up. But we made it and when we saw the sign that we only have 20 minutes left, we could already picture ourselves in front of the chalet, enjoying a cold beer. But here comes the best part of the story so far. Something that I have never witnessed before. We arrived at the Negoiu Chalet, tired and looking forward to put our backpacks down and just as we got there we got this. An amazing rainbow over the mountain, right behind the chalet. As it had rained a bit and stopped just before we got to our destination, the rainbow had formed just a few minutes before our arrival. We were completely mesmerized about what was happening in front of our eyes and then, when we look a bit to our left, we saw another rainbow forming. Now that was something totally unbelievable and unimaginable. It was worth every effort so far, it was the perfect beginning of our trip. And having this beautiful sunset afterwards, just made our day perfect, more than perfect, like a dream. On Saturday we woke up early to start our ascent to the Negoiu Peak. The weather didn’t look very good, it was quite cloudy, but we said that we have to do it no matter what. So we started our trip, following the blue triangle path . It was supposed to take us about 3 and a half hours to get to the peak. For the first 30 minutes, the path goes through the forest and you have to cross some bridges. Shortly after coming out of the forest we get to the Goat Stone (Piatra Caprei), where we cross the Sărata River. If we look on our right we can also see a beautiful waterfall, which, this year, due to the heavy raining, is full of water. From this point the hard part begins and we left from the chalet only 45 minutes before. From here you only go up. And up. And up. In about an hour you get to the Lunch Stone (Piatra Pranzului) where you can have a quick stop, if the weather is good. For us, this was when the fog started to appear and to make things a bit more complicated. Here you are quite at the middle of the trip, but for us it took a bit more as the fog was quite dense and we had to be very careful where we stepped. The next milestone is Cleopatra’s Needle (Acul Cleopatrei), which we almost missed because of the fog. And from here the real adventure begins. You have to walk only on rocks, on your left and right there is only the abyss, so each step has to be very well calculated. Fortunately we passed this area safe, in about 15 minutes and we got to Cleopatra’s Saddle (Saua Cleopatrei), where we saw another nature’s incredible show. On one side of the mountain (where we came from) it was fog and on the other side no fog at all. As if the mountain was stopping the fog to come with us. From here we had only 30 minutes to the top and we could already see the peak in front of us. From the Cleopatra’s Saddle we went on the red line path up to the peak. As we were approaching it, the big cloud was getting down on it as well. And soon the peak was not visible anymore.But we continued our trip. The last part until getting to the peak is a climbing part, so again very careful with where you step. And we finally made it. Unfortunately we couldn’t see anything around us, but we were there. 2535 meters high! Yey! We only stayed for about 5 minutes because thunders started and the storm was about to start so we had to hurry back. We went back on the same way we came. We had initially planned to come back on another way, but the weather didn’t look too good so we chose the safe way. We got back at the chalet around 4 PM, we spend in total about 7 hours on this trip, including stopping for a quick lunch. On Sunday, we went back to the place where we had left our car, but on the way, about 20 minutes from the chalet, we made a stop to the Serbota Waterfall. This was our weekend. I was happy that we made it up to the Negoiu Peak, but also a bit sad that the weather didn’t let us enjoy the view and the mountains even more.